KUALA LUMPUR (Aug 29): Eco World International Bhd's (EWI) 70%-owned UK joint venture (JV), Eco World London Holdings Ltd, has signed heads of terms with Invesco Real Estate and its investors for one of the most significant build-to-rent (BtR) deals ever undertaken in the UK. The latest deal comes on the heels of the completion of an acquisition of EWI's eighth site under a JV with Willmott Dixon on Aug 20. 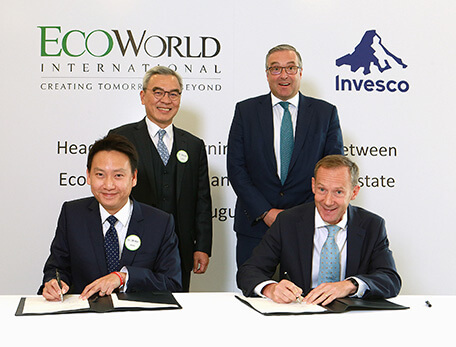 In a filing with Bursa Malaysia today, EWI said EcoWorld London has agreed terms with Invesco Real Estate and its investors to forward fund the development of more than 1,000 new BtR residential and commercial units in Kew and Barking in the UK, valued at nearly £400 million. "This represents one of the biggest single commitments into the emerging UK BtR sector," it added. As both parties head into a period of exclusivity, the detailed contractual arrangements are targeted to be concluded by the end of October. According to EWI, the Kew site is located next to the new Brentford Football Club's 17,250 capacity stadium that is currently under construction and just minutes away from Kew Gardens, a Unesco World Heritage Site. The Barking site, meanwhile, is located next to the historical Barking Abbey, which housed William the Conqueror in 1066 while he constructed the Tower of London, it added. "Both sites are well connected to Central London through train and underground networks and offer highly desirable yet affordable rental accommodation for tenants. "EcoWorld London will complete the construction of the developments to the high specifications agreed with the investors and will then undertake the long-term management of the assets on their behalf," said EWI. Planning permission has been secured for both sites and development work has already commenced with construction due to complete in stages from 2020 onwards. "The deal underlines EcoWorld London's commitment and ambitions for the BtR side of its business as the company will continue to seek opportunities for similar BtR agreements as part of its growth strategy," EWI added. EWI cited a research by CBRE, which noted that the annual BtR investment volume in the UK is currently relatively small at £2.4 billion compared with £103 billion a year in the US. "With North American funds now actively pursuing BtR opportunities in the UK, there is huge growth potential for the sector and CBRE expects the annual investment volume to quadruple within five years to £10 billion," said EWI. "EWI sees great potential in the UK BtR market and this deal validates our strategic move to make the fast emerging BtR business one of the key growth drivers for EcoWorld London," said EWI executive vice chairman Tan Sri Liew Kee Sin in a separate statement. "As a business we are perfectly placed to develop and manage these schemes to the high quality that investors and residents expect from us and through EcoWorld London we have the best in class BtR capabilities — this significant investment by a US-based global pension fund in two of our projects is testament to that. "In the future, we will seek to do more deals of this kind and we have already received expressions of interest from other funds, particularly from Asia, keen to pursue potential investments into the UK BtR sector," he added. EcoWorld London chief executive officer Cheong Heng Leong said the timing of this announcement is important as it demonstrates London's enduring appeal to well-informed global property investors who can see beyond current pre-Brexit market uncertainties to seize good opportunities to acquire quality assets. "On our part, the BtR business model is an ideal structure for us to anchor our UK growth ambitions as it enables us to effectively leverage on a relatively small amount of upfront equity to fund the entire BtR development and generates positive project cash flows earlier. "As a result of this our BtR business can be scaled up very quickly and we will be able to work on multiple projects concurrently," he said. "This will stabilise and enhance EcoWorld International's income generating capacity going forward to include steady cashflows from institutional investors buying BtR properties to complement retail sales made to local homeowners and international investors on the open market sale side of the business," added Cheong. EWI has nine ongoing projects in the UK and two in Australia with total gross development value of £3.4 billion and A$558 million respectively. EWI shares ended the morning session unchanged at RM1.08 today, with 545,500 shares done, bringing a market capitalisation of RM2.59 billion.